Negligent Spine Surgery | Simmons and Fletcher, P.C. The typical course of care for a herniated disc is to try conservative care such as physical therapy or chiropractic care, then consider epidural steroid injections, then consider spinal surgery. No matter the treatment option, all medical providers have an ethical and legal obligation to ensure they are properly qualified to provide treatment to a patient. Unfortunately, we have seen some cases where an unqualified pain management doctor attempted to perform surgery himself,without proper training, rather than referring the case to a qualified orthopedic or neurosurgeon. If you or a loved one has suffered severe injuries as a result of medical negligence during a back surgery or neck surgery performed by a medical provider who you suspect did not hole the proper qualifications, call Simmons and Fletcher, P.C. to discuss the potential for a medical malpractice claim today at: 1-800-298-0111. Herniated discs are a common injury that people may suffer due to many different types of injuries. They are often referred to as disc herniations, protruding discs or even bulging discs. Discs in the spine are a form of padding between the vertebrae that basically are comprised of a soft gel-like center with an outer protective layer. If the disc is compressed, the center can push out towards the protective layer resulting in a protrusion or bulge. If the outer layer is pierced, allowing the center to extrude out of the disc, this is a herniation. Herniated disks can cause nerve root compression due to the extruding material and/or due to swelling of the soft tissue around the disk. When you suffer from nerve root compression, this can be extremely painful and even result in radiating pains along the nerve that is encroached by the disc. A discectomy is a surgical procedure that aims to provide relief from chronic pain caused by a herniated or bulging disc. It is a relatively routine procedure for a qualified surgeon. The procedure is aimed at removing intrusive herniated disc material so as to relieve pressure on the abutting nerve. Unfortunately, some pain management doctors who are simply not qualified to do this procedure are doing it anyway. This can result in serious surgical error and accidental damage to the nerve, tissues, or the protective sheath around the spine. 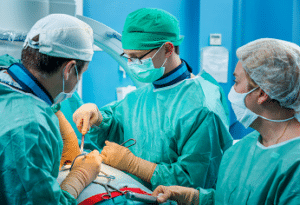 Who Typically Performs a Discectomy? A licensed neurosurgeon or orthopedic surgeon can perform surgery on your spine. Before undergoing any serious surgery, you should always consult a properly trained medical professional. Spine surgeons will seek specialized training to be able to perform a discectomy, so always make sure your doctor is properly qualified before undergoing surgery. A discectomy is a relatively common procedure; however, when performed negligently, the damage done can be permanently life-threatening. Simmons and Fletcher, P.C., provides free consultations to those who have been injured due to the negligence of another party. Medical professionals who operate on individuals without the proper training are committing medical malpractice and should be held liable for the serious injuries associated with their actions. Call 800-298-0111 to learn more about your rights.